Part 1. Organizational and Psychosocial Work Environment. Organizational Structure. Participatory Ergonomics. Management of Complex, Large Scale Technical Systems. Manufacturing Systems and the Organizational Environment. Assembly and Service Systems and the Organizational Environment. Paving a New Model for Industrial Performance: Reflective Production System in Car Industry. Environmental and Individual Issues. Part 2. Human Resource Development and Human Competence. Training Systems and Organizational Learning. Part 3. Front Line Technologies. 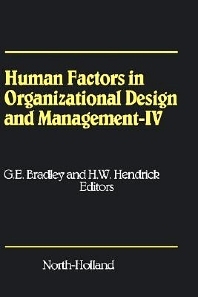 Design of Information Technology Systems and Organizational Change. Advanced Applications of Computer Technology. Information Technology and the Organizational Environment. Part 4. Labor Market and Society in Change. Human Resources, Innovation Systems and Economic Development. Work Organization – Patterns of Work – Family Interface. Cross Cultural Perspectives and Applications in Organizational Design. Part 5. Health, Stress and Well-Being. Health and Stress – Strategic Preventive Actions. Well-Being and Health. Author Index.